MASES has been campaigning against the Sexist, Racist Notion in the Emami Advertisment (Emami Cream for Men). Kotravai, founder MASES created a Petition on Change.Org and gained support from People with similar thoughts. The petition has gained about 480 signatures. She also created an invitation on Facebook inviting People to sign the invitation. It has gained about 120 attestations. Apart from this Ms.Venkadesan Neelakrishnan, Volunteer in MASES did one to one campaign with People in Odisha and got 50 hand written signatures. Kotravai launched MASES formally on 10th March, 2012 and took the campaign against EMAMI to next level. A huge banner was made and printed in the venue. Many activists and supporters signed on the banner registering their Protest against this advertisement which demeans ‘Femininity’ (the femininity by itself is defined by Men /male chauvinism) and the racist notion in it. 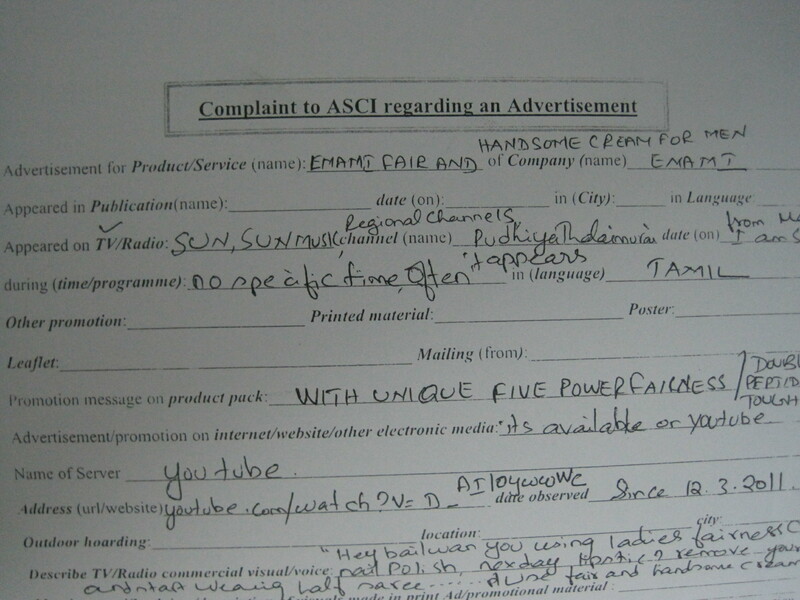 During May, 2011 Kotravai had filled a complaint just with about 21 signatures to ASCI. ASCI did not respond to any of the mails, followups. Hence she restarted the campaign following the frequent telecast of the advertisement in Tamil Channels. Popular Actor Surya has been casted in this advertisement. It is really sad that Actors endorse such products and contents. 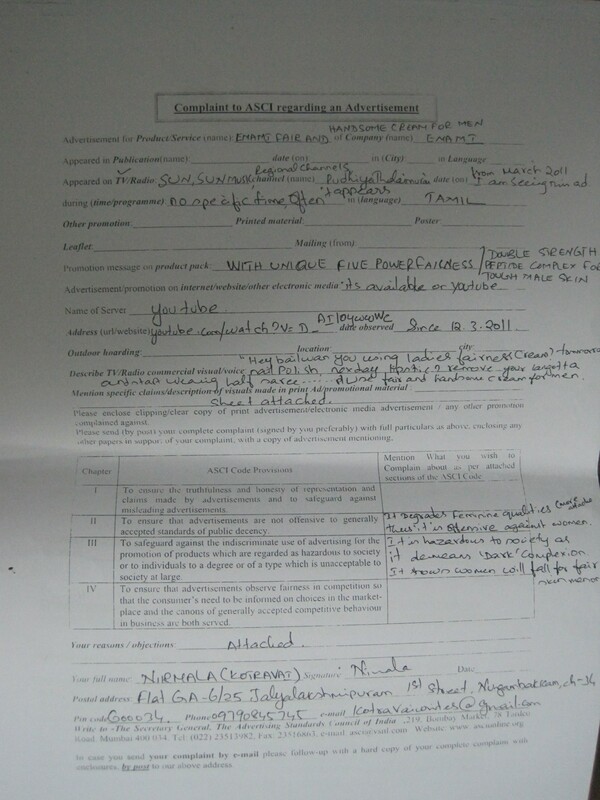 Kotravai has re-filed the complaint to ASCI on 24.4.2012. 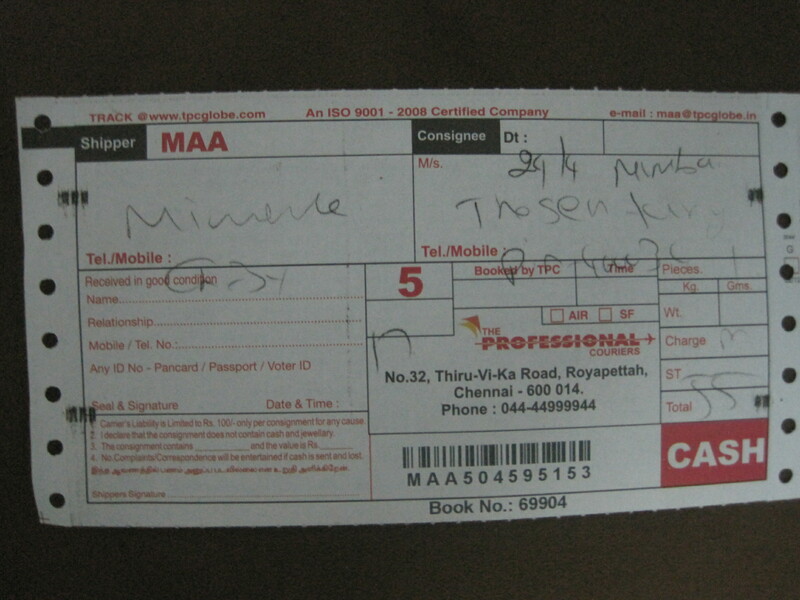 The Complaint Copy & the courier Bill is attached here for reference. If ASCI fails to respond, she plans to write to I&B Ministry also use RTI and demand answer from ASCI. Respective Documents, Signature Copies have been couriered to ASCI. We are deeply concerned about the dreadful incidents of barbarous atrocities by the West Bengal government upon the peaceful democratic protest movements of various mass organisations, civil rights groups and individuals opposing the forcible eviction of Nonadanga slum-dwellers in the name of ‘development’ and ‘beautification’ of Kolkata followed by malicious arrests of the social activists and their continued detention and a heinous attempt to impose the draconian act UAPA on Deblina Chakraborty, a committed social activist and people’s leader, implicating her in cooked-up charges. On 8th April 2012, a huge contingent of police arrested 69 demonstrators from the Ruby Hospital crossing of EM Bypass of East Kolkata when they had been protesting against the violent demolition of the Nonadanga slums and forcible eviction of hundreds of populace of that colony on March 30th. All those protesters illegitimately apprehended including women and kids were put in the central lock-Up of the Kolkata police headquarter at Lalbazar for nine hours and cases under section 151 CrPc were slapped on them. In late evening, all the captives were released on PR bond except seven civil rights activists. Those activists kept in confinement were Deblina Chakraborty, Debjani Ghosh, Abhijnan Sarkar, Prof. (Dr.) Partho Sarathi Ray, Dr. Siddhartha Gupta, Samik Chakraborty and Manas Chatterjee. They were produced in the ACJM court of Alipore next day (9 April) and all of them were remanded to police custody till 12th April. They had falsely been charged with a number of stringent non-bailable criminal cases made-up by the police under Sections 141 (unlawful assembly), 143 (punishment for unlawful assembly), 148 (rioting armed with deadly weapon), 149 (offence committed in prosecution of common objective of disruption), 332 (voluntarily causing hurt to deter public servant from his duty), 353 (assault or criminal force on public servant) of Indian Penal Code. On 12th April, Deblina and all other detainees were sent to jail custody till 26th April after being produced in the court. Surprisingly, in the evening when the defense lawyers had left or were about to leave, the CID put up papers in a secretive manner for the police remand of Deblina Chakraborty in three additional cases—two of which are old cases related to “sedition and waging a war against the state” and allegedly connected with incidents that supposedly took place in Nandigram and Bishnupur during the tenure of the former Left Front government. Furthermore, she was tagged in an old murder case under UAPA. The magistrate granted the plea without listening to the response from the side of lawyers who stood by the accused. Deblina was taken to Bhabani Bhawan for interrogation and she will be remanded to CID custody till 21st April. The other six captives were sent to Alipore Central Jail. Deblina was a student of the International Relations Department of Jadavpur University. She left her studies to carry on democratic movements and stood by the side of the people. She was devotedly associated with the Singur Anti-land grab movement that had prepared the ground for Mamata Banerjee to come to power. When the people of Nanigram raised their voices against the formation of SEZs and Chemical hubs under the notorious Salem industrial group, she went there and took part in the people’s heroic struggle launched by the Bhumi Uchchhed Pratirodh Committee (BUPC) against displacement from their land and habitats and was also instrumental in forming the ‘Matangini Mahila Samity’ (MMS). The MMS was a women’s forum that fought against patriarchy, against consumption of liquor, against CPI (M) ruffians (harmads), and was associated with the day-to-day struggles against all onslaughts carried out by the gang of Lakshman Seth-Binoy Konar-Sushanta Ghosh-Ashok Pattanayak-Tapan-Sukur-Naba Samanta. In this land struggle, the TMC, Congress, CPI, SUCI and other political forces also played their part within the BUPC. The police under the previous Buddhadeb Bhattacharjee-led left-front regime issued threats to arrest Deblina under the UAPA, but protests from different quarters as also hunger strikes started by her and other activists at College Square thwarted such attempts. The new government under Mamata Banerjee — indubitably more brutal and vindictive– picked up the torn shoes left by her predecessor and completed the process by booking her under this draconian act. After coming to power, Mamata Banerjee turned her heat against the ongoing peoples’ movements and initiated a slander and intimidation campaign by denouncing the ‘Matangini Mahila Samity’ as a ‘satanic brigade’ to gag democratic dissent and protest menacingly and the police as usual condemned Deblina as a ‘Maoist’ who could be detained, tortured, humiliated and made a prisoner at will. Deblina had been with the people’s movement for quite some years, functioning openly and participating in various mass movements that took place from time to time. She was never arrested earlier. Now she has been picked up during her participation in the Nonadanga anti-displacement movement and tagged in that earlier case for which charge-sheets had already been submitted. Deblina is a dedicated social activist who always fights for justice to the best of her ability and stands by the side of the oppressed people in their struggles for rights and dignity. Such a person has now been entrapped under the UAPA in a most conspiringly and cowardly manner. We are quite apprehensive that the intelligence officials would subject Deblina to brutal mental and physical torture in police custody and send her to prison to languish there for as many years as possible. Should we allow such injustice to be done by this vindictive and cruel chief minister of West Bengal? Deblina has started a hunger strike to protest against the unjust incarceration and slapping of UAPA on her. At this juncture, we appeal to all justice-loving and freedom-loving people of the country to condemn and raise their voices of protest against the despotic police action subverting the law and illegitimate arrests of all the social activists and a heinous attempt to impose the draconian act UAPA on Deblina Chakraborty on cooked-up charges. Please demand in the strongest possible terms the immediate acquittal of Deblina Chakraborty and six other prisoners arrested for standing in solidarity with the forcibly evicted people of Nonadanga and raising their voices against injustice. Please go through the petition and sign, and circulate it among your friends and colleagues as widely as possible. I spoke to V. Pushparayan at 1015 a.m. today. According to media reports, a gang instigated by Pushparayan and Udayakumar, attacked and injured Sahayaraj (President’s husband) and Stalin (Sahayaraj’s brother) at 830 p.m. on 14 April, 2012. The above two media reports do not even bother to interview the people accused of this alleged crime. The allegation is made into a fact, as if the reporter had observed the attack. Here’s the version from Idinthakarai. 1. On Saturday, in the morning, the Struggle Committee received a letter from the Panchayat President making it seem as if the protestors are standing in the way of legitimate functioning and administration of the Panchayat. 2. At between 6 and 7 p.m., Sahayaraj and a few others went to the space that is being used as a public bathing area and toilet by the protestors. Sahayaraj picked up a fight with the women gathered there, shut off the water, locked off access to the toilets, and took away the keys from Mr. Suganthan, a differently abled person. The toilets are actually a women’s toilet constructed specifically for women. The abused the women using vulgar language and Mr. Sahayaraj threatened them saying no woman should use these toilets from Sunday onwards. Ms. Sahaya Initha, Councillor of 13th ward, who spoke to me on phone said that the toilets were opened this morning after the women threatened to complain to the BDO. At 8.30 p.m. the same day, Mr. Santhiya, s/o Felix, residing at North Antoniyars St, Idinthakarai, and driver Mr. Livings, s/o Remigius, were returning to Idinthakarai by Vehicle No. TN 72 Q 4323. A car coming in the opposite direction suddenly swerved towards them, narrowly missing a head-on collision, but scraping the car. The occupants of the two vehicles got out. The other vehicle was occupied by Mr. Sahayaraj and Mr. Stalin, his brother. Both were reportedly inebriated. They got out, and thrashed Santhiya and Felix, and reported at the Koodankulam Police Station that they were the victims. Mr. Santhiya and Felix were too afraid to report to the police as any Idinthakarai resident can be arrested on any pretext because of the large number of false cases filed on unknown people. Last night, another incident has happened. Mr. Stalin — Sahayaraj’s brother — owns a large shed which used to house vehicles and cattle. Last night, the cattle and vehicles were removed and the shed was set afire. A 2000 strong dalit community lives near the Shed in the village named Keezh Vijayapathi. The community knows who set it afire, and they plan to file a petition with the police today. Mrs. Egethin Sahayaraj, the invisible woman president whose husband is the proxy President, was elected on the basis of a poll promise that she will stand with the people against the nuclear power plant. But since 19 March, both the President and her husband have been going back and forth on their promise. Mr. Sahayaraj has tried to provoke the protestors on several occasions and failed. On the day that the Struggle Committee ended its indefinite hunger strike, Mr. Sahayaraj switched on the microphone after the day’s protest was called to an end and began berating the media that was present there. He said that the media was mis-reporting issues and making it appear as if there are no people left in the protest pandal despite the presence of so many thousands. He declared that photographers who go around photographing empty spaces to project the struggle as weak should have their legs broken. This speech was made ostensibly to create disaffection among the media towards the struggle. Mr. Sahayaraj is also being worked upon by two of his relatives — Mr. Besky and Mr. Stanley — who are reportedly DSPs in the TN Police. One is with the Q branch and another works in Theni district. Outraged over an advertisement of a cosmetic product depicting intimate details of a woman’s body, the All India Democratic Women’s Association (AIDWA) has demanded the Centre’s intervention to withdraw the clip being shown on some television channels and Internet. “The AIDWA is deeply outraged by the visual depiction which shows the extent of the perversion of the company and the promoters of the ad. This advertisement in the name of personal care shows graphic and intimate details of a woman’s body which is demeaning and derogatory to women. It also promotes racist stereotypes equating fairness with beauty,” the statement said. The advertisement constitutes an offence under Clause S3 of the Indecent Representation of Women’s Act, Section 292 of the Indian Penal Code and Section 67 of the Information Technology Act, 2000 along with the relevant rules and regulations, it said. Demanding that the advertisement be withdrawn immediately, the statement said the association had taken up the matter with the Ministry of Information and Broadcasting seeking appropriate action against the advertisers, and the company concerned, as also for the formulation of a regulatory framework to prevent the proliferation of such portrayals of women in the media. The AIDWA Media Monitoring Committee is filing a complaint against the advertisement and the agency responsible for it with the Advertising Standards Council of India, Shyamali Gupta, the association president said. படைப்புகளுக்கான இலக்கணங்களும், ஒழுக்கங்களும் உலகெங்கும் உடைத்தெறியப்பட்டு படைபாளிகளுகானா படைப்புவெளி எல்லைகளை கடந்து நிற்கும் இன்றையகாலகட்டத்தில் எதை வேண்டுமெனிலும் யார் வேண்டுமென்றாலும் ஓர் படைப்பாய் உருகொடுக்கலாம். அது ஓவியமோ, இலக்கியமோ, இசையோ, நடனமோ, நாடகமோ இல்லை சமகாலத்தின் மிகப்பெரிய ஆதிக்கம் நிறைந்த கலையான சினிமாவாகவும் இருக்கலாம். ஆனால் எந்த படைப்பையினும் அப்படைபுக்கும், படைப்பாளிக்கும் சமுகம் சார்ந்த அக்கறையும், பொறுப்பும் அவசியம். அதிலும் வெகுசனத்தை எளிதில் சென்று சேரும் சினிமாவுக்கு பொறுப்பு மிகஅதிகம்,மக்களின் மனதிற்குள் எளிதில் சென்றுசேரும் திறன் மற்றகலைகளை காட்டிலும் சினிமாவுக்கு அதிகம், ஆனால் நிஜம் எதிர்திசையில் பயணித்துக்கொண்டிருகிறது, நம் சூழலில் தமிழ் சினிமா படைப்பாளிகள் எத்துனை சமுக அக்கறையோடு படமெடுக்கிறார்கள் என்பது பெரும் கேள்வியே. கலையாய் பார்க்கப்படவேண்டிய, வளர்க்கப்படவேண்டிய ஓர் அமைப்பு அமெரிக்கமைய தாக்குதல்களால் உருவான காலம்தொட்டே மலிவு வியாபாரமாய் மட்டுமே செயல்பட்டு வருகிறது, நம் சமுகத்தின் பெரும் அவலமாகவும் நிற்கிறது. அதிசயமாய் எங்காவது ஒன்று இரண்டு நல்லப்படங்கள் வருவதை தவிர்த்து மற்றவைகள் மலிவு வியாபாரமே. 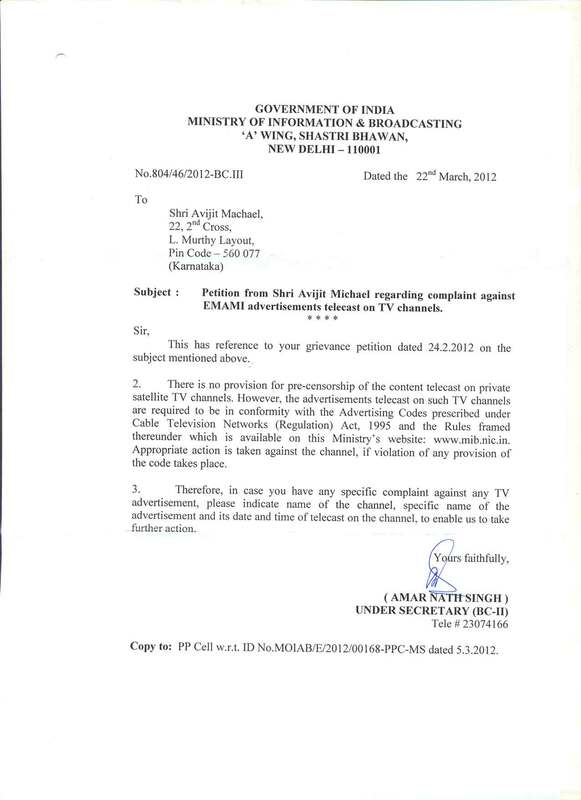 I & B Ministry wants specific time & channel to be mentioned in our complaints. Hence Pl let me know if the EMAMI Fair & Handsome cream for Men advertisement is appearing in the recent months…. if so what time…because I have not been seeing the advt telecast in past 1 month… or may be I have not been watching T.V so often…. NEW DELHI: In a move to empower women, a government panel wants that a mother should be listed as the first guardian for all official purposes instead of a father, arguing that she primarily looks after the children. “Since normally it is the mother who primarily looks after the children, she should be listed as the first guardian ,” the Planning Commission’s Working Group said in its report. The panel has recommended a review of all laws to make mothers equal guardians of their children. Currently , there is a practice of mentioning the father as the first guardian in all official documents such as school admission forms, birth certificates etc. The group has suggested that all existing regulations and rules ought to be revisited to ensure that the mother’s signature as a guardian is universally accepted in all official records. The recommendation is part of a slew of measures suggested by the group to make laws more gender sensitive . It also asked the government to revisit laws related to maintenance and guardianship to ensure separated women get adequate maintenance and custody rights over their children. The suggestion, if accepted , would ensure women’s first right over a child whether she is married or divorced, said a member of the group. “Once all laws are relooked in light of the recommendations , the women will not be forced by any government or private agencies such as schools or passport offices to mandatorily disclose husbands’ names,” she said. “The existing laws on the issue are archaic and were conceptualized with a patriarchal mindset ,” said another member. The path-breaking recommendations would ensure that mothers have an equal right in care-giving as well as in crucial decision-making processes, financial or otherwise , affecting children’s lives. The law commission in its 83rd report submitted in 1980 had suggested amendment in guardianship laws. ” The Guardians and Wards Act, 1890 was enacted 90 years ago. 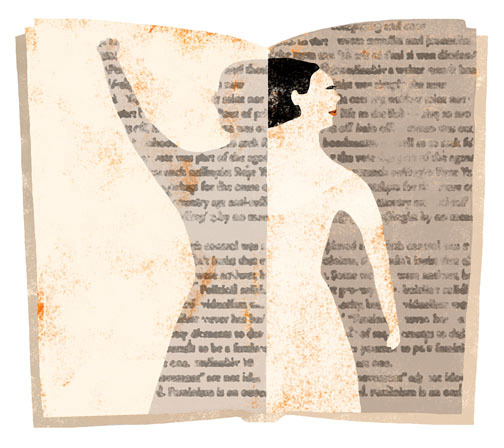 At the time, women had scarcely any rights: for them there was only social and legal degradation , material insecurity and other manifestations of dominance and false superiority of men,” it had said.